2018 was a year that a lot of folks in Kerala would want to forget. First you had one of the greatest floods of the century causing immense damage, quickly followed by the all-encompassing Sabarimala issue which kept all its denizens busy for most of the season. Maybe it is a reflection of the mood of the state for most of the year that this period did not provide too many cinematic works in the mainstream space that made an impact. Yes, there were exceptions like Ee Ma You, Sudani from Nigeria, Eeda and Poomaram but otherwise there was very little to write home about, despite a fantastic 2017. With mega biggies like Odiyan and Kayamkulam Kochunni creating more hype about the business done rather than artistic merit and falling short of pleasing either the audience or critics, we probably need Dileesh Pothan to make a film every year! *** Anyway, before I start, just a regular quick disclaimer – I lend a keen ear to Malayalam songs but have no knowledge of music in any way, so this is just my personal listing of the top tracks of films released in 2018. Last year, I had expanded my listing from 20 to 30 songs and this year I have taken it to 40, adding a bit more flavor from small films also which have very little claim to fame. Poomaram featured in 2016 and 2017, so I have left out the tracks that I had considered in the last 2 years but the album still has enough numbers! There was a soulful melody by Vijay Yesudas – Mazha Megham (‘Krishnam’) – which was originally in my list but dropped after it mysteriously disappeared from legitimate online space. The most popular video would definitely have to be Manikya Malaraya Poovi (‘Oru Adaar Love’) but the film has been inordinately delayed and did not it hit the screens in 2018, thanks to the Priya Varrier effect. Either way, it was the wink more than the actual song that gave it all the hype it created. Keeping the normal practice of benchmarking, I am more than surprised that while the cinema has been pretty placid this year, the musical side has been pretty exciting, which is one of the reasons I decided to reluctantly expand my listing to 40 songs. While we did not have the classical touch that was seen in 2017, there were a lot of songs which wafted through with the scent of the older times of the 80s and this welcome throwback to the Golden Era sprinkled a fair amount of nostalgia, like the audio tracks of Oru Kuttandan Blog, Kaly (with its nod to Ilaiyaraja) and Thattumpurathu Achuthan (with its strong flavor of bhajans). Last year did not see too many Vijay Yesudas songs but this year, he dominated the charts heavily, along with Shreya Ghoshal for company. This year saw the best and worst in terms of non-native singers in the contrast offered by Abhay Jodhpurkar’s effortless rendition of Minnamini (‘Koode’) without a hint of a non-Malayalam accent vis-a-vis the terrible pronunciation of Rekha Bharadwaj in Vishal Bharadwaj’s Doore Doore (‘Carbon’). We continued to have actors crooning to their songs, especially Mohanlal in all his films, and the results continued to undermine the composition; of course, Suraj’s crooning of Ente Shivane (‘Kuttanpillayude Sivarathri’) was an aberration but again, it suited the context. M Jayachandran was fairly prolific and impressed with excellent sound tracks in Ente Mezhuthiri Athazhangal, Aami and Koode while Gopi Sundar had a good outing with Premasoothram. Raghu Dixit’s debut in Malayalam with Koode was pretty successful while Deepankuran (veteran lyricist Kaithapram’s son) finished the year with the wonderful bhakti laced sound track of Thattumpurathu Achuthan. Hesham Abdul Wahab continued to make great music for films that tank, including one of the tracks of the year Angane Njanum Premichu (just like Cappuccino in 2017); wish some of the top directors take a note. Singer Sayanora made a successful leap into music direction with the short entertaining track of Kuttanpillayude Sivarathri (it was also a year she made her dubbing debut with Trisha in ‘Hey Jude’). Last year’s music was led by Shaan Rahman and Bijibal but they were somewhat silent for most parts in 2018 while it was a pleasant surprise to see Vishal Bharadwaj make his foray into Malayalam cinema with Carbon (whose best song Kaattin Saarangi was released much after the film left theatres), two decades after he composed Daya. Premasoothram interestingly has a nice Sanskrit song, something that we haven’t heard for a long, long time, except maybe in the case of a classical/semi-classical or bhakti song. Angane Njanum Premichu demonstrated how an excellent music track can be imminently forgotten by virtue of how it is used in a film. Don’t judge the strength of the film’s melodies by its visuals but seriously, it is a pity how poorly the songs were shot and I feel sad for Hesham. 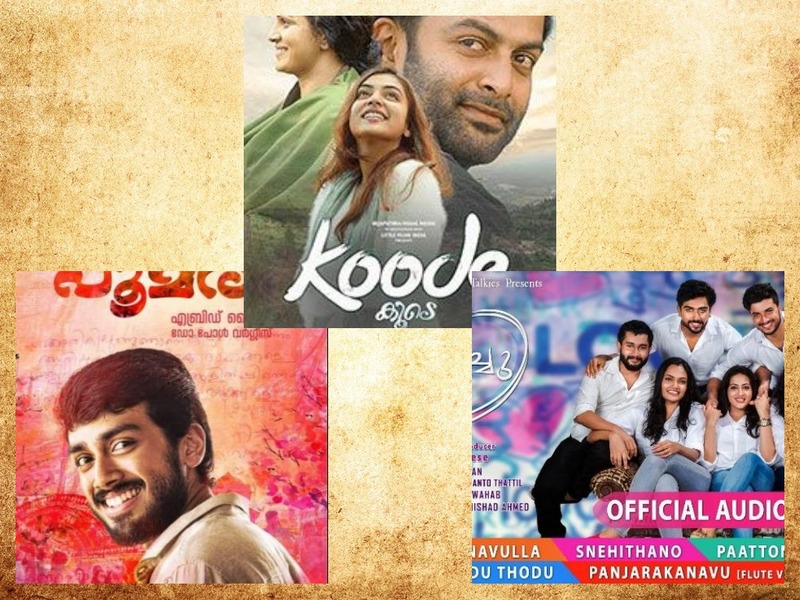 Koode had an interesting musical combination of M Jayachandran and Raghu Dixit together and the lovely voices elevated the impact. But Poomaram was undoubtedly the track of the year and practically every song in this long delayed movie spanning three years was noteworthy. This musical drama which was basically a keyhole observation of the MG University Youth Festival through the director’s lens had multiple composers, lyricists and singers and offered a dazzling sense of music. Of course, the way the film and its audio track release was managed (or mis-managed) was a lesson in itself; nevertheless, the splendid medley of enthralling art forms on screen was worth the long wait and kudos to Abrid Shine for pulling off such an awesome experiment in mainstream cinema.